Use our free UMF-MGO calculator to compare UMF and MGO manuka honey. Enter a manuka honey MGO rating in mg/kg or ppm. Press the ‘Convert to UMF’ button to see the equivalent UMF rating based on non-peroxide activity. Enter a manuka honey UMF rating. Press the ‘Convert to MGO’ button to see the equivalent MGO content (mg/kg). Most premium manuka honey from New Zealand carries a UMF rating. UMF is a the New Zealand UMF Honey Association quality mark encompassing the attributes of manuka honey that make it special, including its non-peroxide activity (NPA). 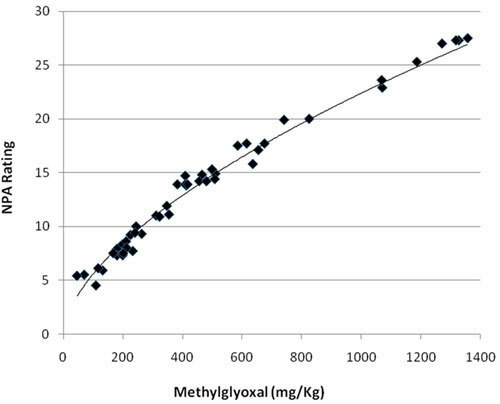 A UMF rating also takes into account the honey’s concentration of DHA (dihydroxyacetone), Methylglyoxal, and Leptosperin. For the purposes of conversion, we assume a honey’s UMF rating is generally equivalent to its non-peroxide activity measured as % phenol. Methylglyoxal (MGO) is one of the chemical markers of manuka honey. Some honey brands use methylglyoxal content alone as the basis of their honey grading system, notably Manuka Health. There’s a mathematical relationship between a manuka honey’s concentration of methylglyoxal and its non-peroxide activity, and thus its equivalent UMF rating. For the purposes of comparing MGO and UMF manuka honey, we assume a honey’s UMF rating is equivalent to its non-peroxide activity. This table shows UMF ratings and their MGO equivalents. UMF and MGO manuka honey is available world-wide. See our lists of the Top Manuka Honeys on Amazon.com, Amazon UK and Amazon Germany. Comvita, Happy Valley, Melora, Taku Honey, Wild Cape, Manukora, ApiHealth and many others. See the UMF Honey Association website for the complete list. Do not use this manuka honey UMF-MGO conversion calculator for ‘bioactive’, ‘total activity’ or other ratings, as these non-UMF honey ratings mostly do not qualify as genuine premium UMF/MGO manuka honey. Brands promoting manuka honey that is neither UMF-rated nor MGO-rated include Manuka Doctor, Queen Bee, Wedderspoon, Healing Honey, Y.S. Eco Bee Farms, Manukaguard, R. Feldt, Hoyer, Sonnentor. Some of these non-UMF manuka honeys show ratings on the labels such as 12, 16 or 24+ that look confusingly like UMF ratings. Manuka honey without a true UMF or MGO rating is unlikely to be premium manuka honey and is more likely to be a blend with other types of honey. Clues to non-premium honey are mentions of ‘total activity’, ‘peroxide activity’, the absence of a UMF trademark, or ratings based on any factors other than UMF or methylglyoxal content. The ExportX manuka honey UMF-MGO calculator implements a conversion formula derived from the scientific research by Adams et al. Their results are shown in this graph. Graph courtesy Andrew Robinson, The Honey Store. Disclosure: ExportX represents New Zealand manuka honey brands in the USA, Canada, UK, Germany, France, Spain and Italy, including manuka honeys from Happy Valley, Taku Honey, Melora, Wild Cape and Manukora.